Occasionally we post articles and recipes from our friends and supporters. 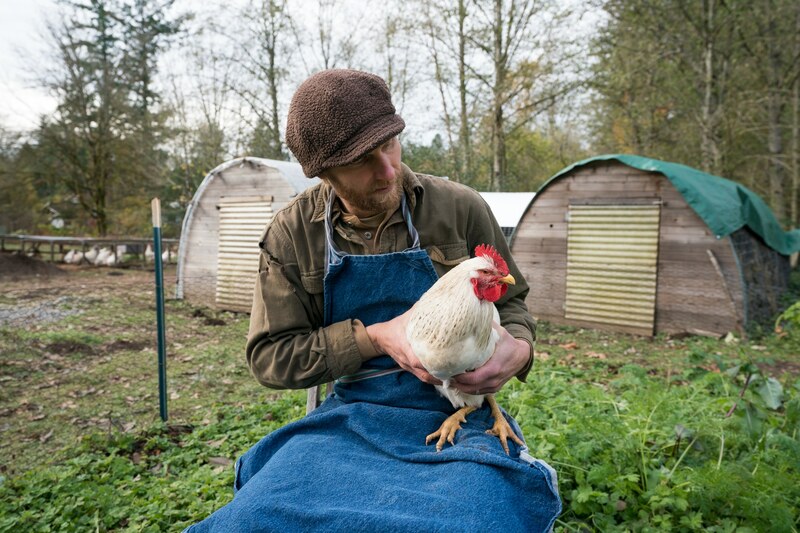 This post is by Alexia Allen from Hawthorn Farm in Woodinville. We’ve been following Alexia’s journey to live and eat solely off her land for the past year and we have become fans of her work. Alexia has taught classes for our culinary education program. To learn more about Alexia, her husband Daniel, and the rest of the ‘farmily’ visit www.HawthornFarm.org. Steam billows out of the big enamel pot as I lift the lid. It’s a gray autumn morning, I’m wearing my blood-stained apron, and my brow is furrowed in concentration as I dunk a dead chicken into the hot water. “Welcome to spa day at Hawthorn Farm,” I tell her as I slosh her up and down. My farmwife humor belies the gratitude I feel for these birds. My husband and I have spent a year of eating only food that we, or our friends, have harvested by hand. This experiment brings history alive. It opens up a world of inquiry. It highlights my bonds with the rest of the living world. And so, I ended the life of one of our old laying hens. Right or wrong, I wrapped her in my apron and let her blood run into the garden bed where I sat. I sometimes sing or cry to accompany this inevitable brush with mystery. I grapple with the fact of how my life requires the death of other beings, plant or animal. This chicken was beautiful, and she wanted to wake up tomorrow morning too. So, isn’t it my responsibility to also live beautifully, to appreciate the sunrise for her? When a cup of chicken broth hits the spot on a blustery day, give a thought to the lives that nourish yours. Every meal is an opportunity for thanksgiving. Pictures included with this post are by Eric Hyatt, www.theanimalsplace.com.